Windows Live Mail & Yahoo! Mail — Yahoo! Mail is the most popular webmail service in the world (second after Hotmail, according to some), with some 250 million users. Windows Live Mail, created by Microsoft, is designed to accommodate both proprietary email protocols like Hotmail's, and standard email protocols like POP3. Yahoo! Mail uses POP3, and can therefore be setup in Windows Live Mail. While Yahoo! Mail is currently the best webmail service available (in terms of interface), it doesn't yet beat the convenience of a desktop email program like Windows Live Mail. This tutorial shows you how to setup Yahoo! Mail in Windows Live Mail: you will still be able to check you emails from a web browser, as you did before. Please note that in order to check your Yahoo! emails from an email program, you need to pay the yearly $20 for "Yahoo! Mail Plus" service. Third-party plugins like YPOPS allow you to bypass the paid subscription, but these will not be covered in this tutorial. Despite of rumors according to which you are no longer required to have Yahoo! Mail Plus to check your account from Windows Live Mail, and you can use any regular (free) Yahoo! Mail accounts with Windows Live Mail, the official Yahoo! Mail documentation seems to indicate that you do still need the Yahoo! Mail Plus service. Setting up your Yahoo! Mail account in Windows Live Mail is a very straightforward process. The second field ("Password") is requesting your Yahoo! 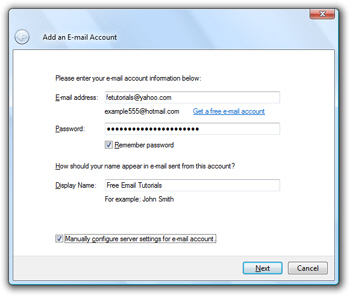 Mail password; it is safe to give it to Windows Live Mail. Windows Live Mail will automatically choose to remember your Yahoo! Mail password, but you can uncheck the "Remember password" checkbox if you want. The last field ("Display Name") determines how emails you send from Yahoo! will appear to recipients. The display name can be anything, and doesn't have to match your Yahoo! Mail user name (the portion of your email address which comes before "@yahoo.com"). The top section of this screen deals with Incoming Server Information: in other words, how Windows Live Mail will retrieve your emails from Yahoo! 's servers. Choose "POP3" as server type. 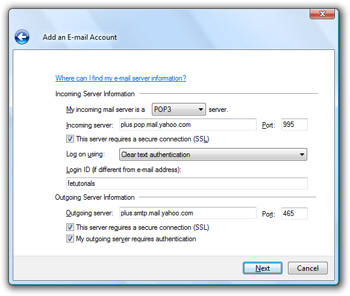 The incoming mail server value is plus.pop.mail.yahoo.com, using port 995. Check the "This server requires a secure connection (SSL)" checkbox. You can leave the default setting for logging on, which is "Clear text authentication". Under Login ID, enter your Yahoo! Mail user name (the part of your email address that comes before "@yahoo.com"). The outgoing server address is plus.smtp.mail.yahoo.com, using port 465. Make sure to check both checkboxes: "This server requires a secure connection (SSL)", and "My outgoing server requires authentication". If Windows Live Mail does not give you this confirmation, it either means that your Yahoo! Mail password was incorrect, that your Yahoo! Mail email address has a typo, or that your Internet connection was faulty. Otherwise, your are ready to use your Yahoo! Mail account. As soon as your Yahoo! Mail account information is downloaded in Windows Live Mail, you will see the standard folders displayed in the left pane, as well as any custom email folders you may have created.